Having keen interest in photography which part of the first photograph of the tree's trunk is the 2nd photograph you posted with a palm behind the bole (trunk)? In the bare trunk picture with your palm behind it appears to me it is about 6 inches in diameter. For a 3 year old seedling of A. hirsutus it is very hard to believe! 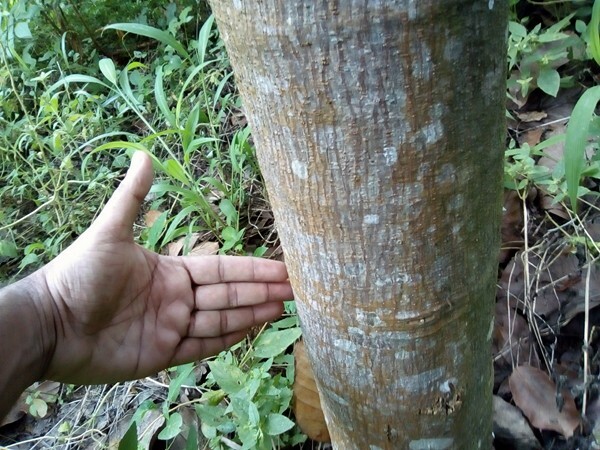 Since the value of A. hirsutus wood is in demand and of steep price why don't they go on planting these trees in Kerala than planting rubber trees (Hevea brasiliensis)? Looking at the bole (trunk) you pictured it appears to me that of a 12 to 15 year old A. hirsutus. Please review my previous posts on this subject. Is that of Areca palm seedling in the back ground of the second picture? Is it missing in the background of the accompanying first picture? It is a grass kinda weed, than can be seen in the bottom part of the first picture also. I am holding the trunk about 1ft. from the ground. In the background what you are seeing is not palm seedlings (that are grass kinda weeds, which can be seen in the first picture also). The tree is 3 years old only. If you can't believe me, please ask the forum member 'DurianLover'. He is growing A. hirsutus in Sri Lanka from seeds I have sent. He reported that the seedlings are very fast growing. Forum member 'Luc' is also growing Wild jack from my seeds. But, I don't have any updates from him about the growth rate. 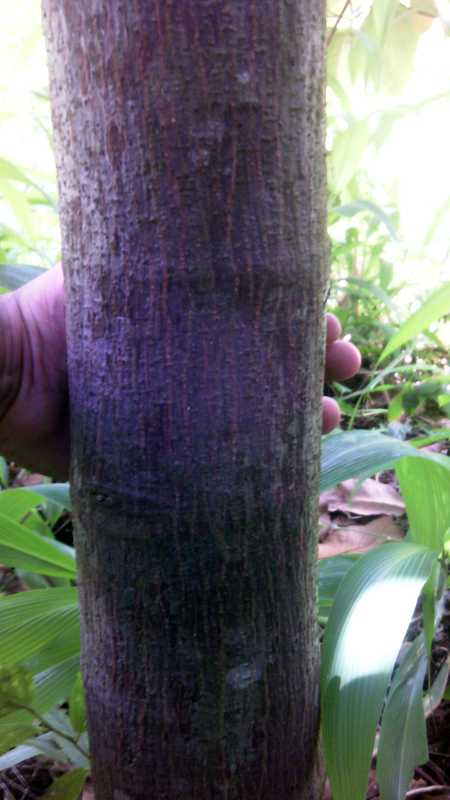 A. hirsutus wood is preferred only after Teak and Jackfruit wood in Kerala. A. hirsutus wood is light weight and at the same time is strong and durable. But, the wood will bend as the weather changes. That is why, it is not used for construction and is used only for making furniture and boats. 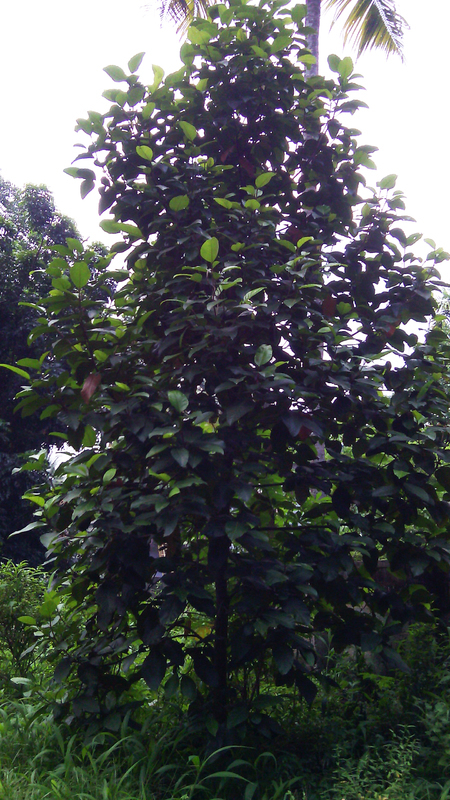 Wild jack wood is not grown commercially, and people prefer to grow Teak which can be utilized in 20 years. A. hirsutus takes more years to form the heartwood and the sapwood is of no use. While sapwood of Teak is durable and used to make furniture. I don't see the reason why vipinrl should be lying. Maybe there are different cultivars of hirsutus with different growth pace. The guy is not from Portugal; he is from Kerala only. I don't think A. hirsutus will flower in 3 years. One more thing: he is living in the HOTTEST part of Kerala (ie., Punalur). Temperature won't fall below 20C in Punalur and goes upto around 44C. I am not sure we are talking of the same person, did you see the link? He should be a member here too. Dear friend, seeing the pictures, I doubt if it is A. hirsutus! In the picture, the flowers are round. But, A. hirsutus flowers are cylindrical (much more elongated than that of Jackfruit). Also, the leaves look different. A picture compilation of Wild Jack is given below. The image is already there in some previous posts of the Forum. Your seed looks much different than mine, yours resemble a lot jackfruit, while mine are smaller and more elongated. I think being a wild species there is a lot of diversity. The guy who sold me the seeds had multiple varieties (different fruits) and the seeds were quite different and recognizable. Now however the seedlings are all the same and I can't distinguish them. Yes, the shape and size of seeds vary from tree to tree. Actually, the seeds shown in the picture are also small (it only appears large as the photo was taken zoomed in). The same tree after a year (4 years from seed). Now, it is about 30+ft. 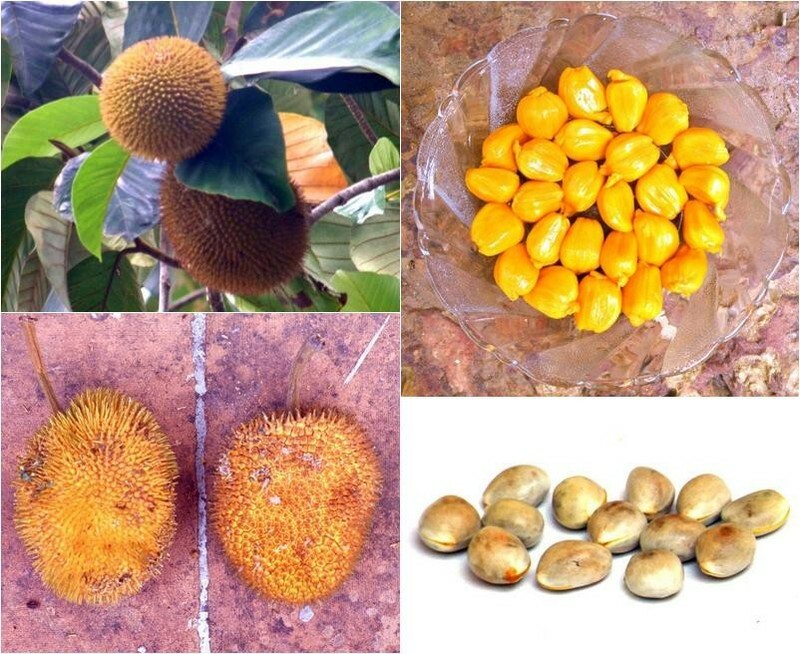 Do you know if Artocarpus Hirsutus fruit is available at Tamil-Nadu state ?. I do know that Jackfruit is Called Palaa Palum in Tamil and Chakka in Malayalam, But got no Idea what Artocarpus Hirsutus is called in Tamil. Moh'd, it's available in Tamil Nadu. Usually called Aiyinipila in Tamil. The Malayalam name Anjili is also used in Tamil. I will try to ask someone from Tamil Nadu state to bring a wild jackfruit fruit to me. Moh'd, are you going to ask them to bring the whole fruit to UAE? I've been trying for the past several years without any luck to have a whole fruit bought to Chennai. 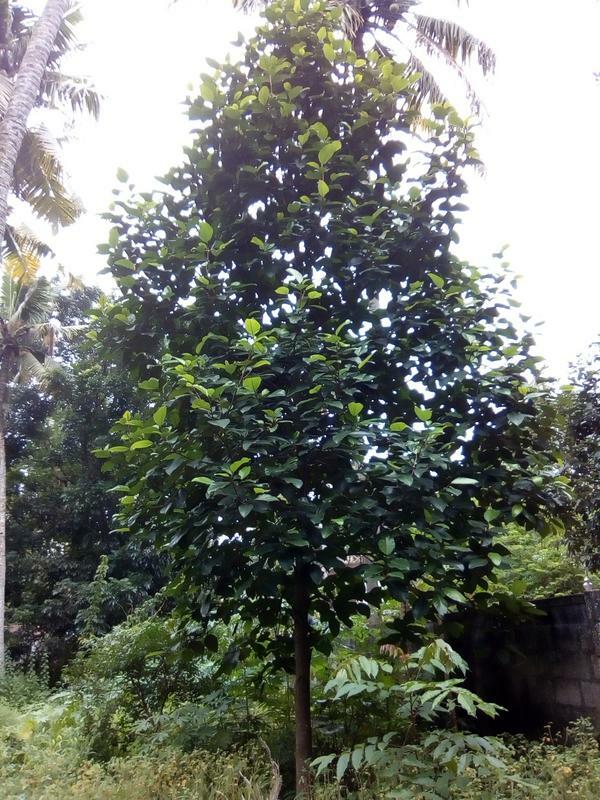 One of my relative has some friends in Thodupuzha who have some trees at their places. Even they are unable to send whole fruit. BTW, are you from Tamil Nadu? I'm a local (UAE) Guy . My father have a small-medium size company that is specialized in importing and exporting goods from India and Australia and to the Arabian Peninsula, and one of his business partner was a guy from Trichy-Tamil Nadu (if i am not mistaken) And that guy usually brings a whole jackfruit when he visit us. I also know a few guys from Bangladesh, Pakistan and Kerala. Yes. Trichy is in Tamil Nadu. BTW, when I saw your request for Tamil name, I assumed you were from here . So, the above two links from FB that I posted would mean nothing to you. This fruit is available further south of even Trichy. In Kanyakumari - the southern most tip of India. In one of the links above - the one where the man is carrying the fruits hanging on two sides of the pole, the author claims that this is the way this fruit has to be carried. If packed in any carton or boxes, the fruit won't last even a single day. I had tasted fruits from atleast 50 Wild jackfruit trees and found only fruits from 5 - 6 tress really good to eat. Fruits from rest of the trees were between 'eatable' to 'not palatable' due to latex, sourness and lesser flesh to seed ratio. Most of the fruits were small in size too. There are two trees producing exceptionally good fruits and I rate them above good quality jackfruits. The fruits weigh upto 800 grams, no latex when fully ripe, large bulbs with smaller seeds and taste excellent. I had tasted fruits from road side vendors many times and was disappointed.